Have you ever looked at the labels of ice cream from a grocery store? Many of them contain added and processed sugars, as well as many strange additives. This is the perfect recipe to try for a homemade ice cream with real ingredients and no added sugar! 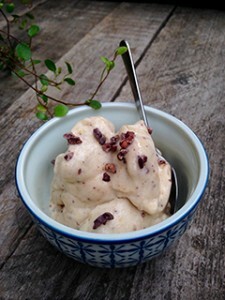 Using whole bananas as a base for the ice cream provides a source of fiber, helping to stabilize blood sugar. It also provides a great source of potassium, which is helpful for muscle function and electrolyte balance. The cacao nibs provide a rich, delicious taste and an excellent source of magnesium. There are over 300 different metabolic processes that use magnesium in our bodies. For example, it aids in the relaxation of smooth muscle, regulation of heart rhythm, and production of energy within the body. Unfortunately, many of us are deficient in magnesium, so it is important to eat sources of food with magnesium in them. Cacao contains an amazing amount of antioxidants- one study actually showed that just one spoonful of raw cacao powder contained over 25,200 antioxidants. These antioxidants have been shown to increase nitric oxide in the blood, which can lower blood pressure. They have also been shown to increase HDL (High-density Lipoprotein), which is a beneficial form of cholesterol and decrease LDL (Low-density Lipoprotein), which is a harmful form of cholesterol. The almond milk in the recipe provides a source of protein and good fat. You can even use some homemade almond milk if you would like. Peel 3 bananas and place them in a sealed container in the freezer until frozen. Place frozen bananas in blender. Pour milk, cacao nibs, and cinnamon into blender. With a standard blender, pulse on ‘ice crush’ mode and with a Vitamix, blend on low speed until smooth, creamy ice cream is made. Serve in bowls, sprinkle cacao nibs or chopped nuts on top, and enjoy! Feel free to replace almond milk with a different kind of milk. About the author: Susan Mitchell is currently a student at the National College of Natural Medicine. She will be entering her third year working toward a Doctoral in Naturopathic Medicine and a Master’s in Acupuncture. She has been involved with the Food As Medicine Everyday classes and is passionate about nutrition and cooking with fresh, whole ingredients. When she is not in school, she loves to travel and create artwork!